MamaBreak: Brianna's Dressing Review: A wonderful new find! So, rarely do I write a review the DAY I get a product. But this one excited me so much, I HAD share!! Brianna's Dressing s based in Brenham, TX and maybe YOU have heard about them because they have won many awards for their dressing and appeared and Women's Health and Cooking With Paula. If you have never heard of them, well you NEED to, because they are hands down the BEST salad dressing I have had in a VERY long time. We were given three flavors to try, but I am going to focus on the Poppy Seed in this review because that is what we tried this evening. Like I said, we JUST got the dressing in the mail . . . today! 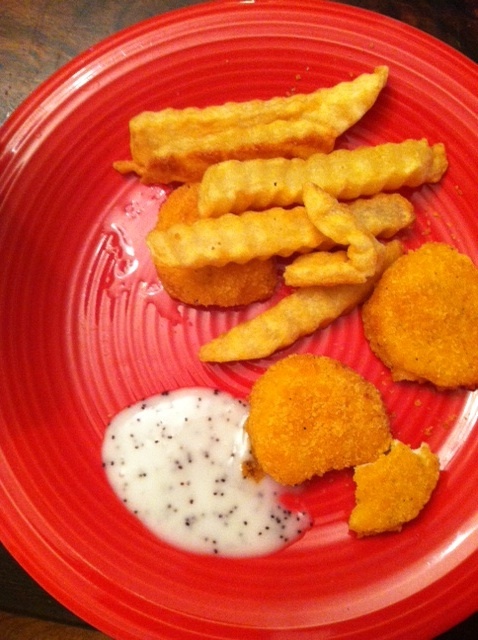 We were having chicken nuggets and fries for dinner (no worries, we also had fruit and milk). Not the healthiest meal around, but it was a quick and easy meal for the family to eat on a very busy night. The Poppy Seed Dressing tasted almost like a sweet ranch. It was amazing on the chicken nuggets and fries! The kids devoured their food dipped in it, and we had a great time! This dressing sounds so good!